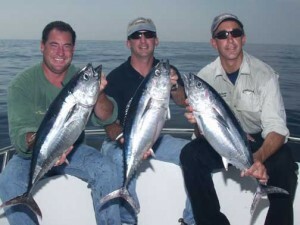 Captains Andy and Rich headed back up to Point Judith to get in on a red hot school tuna fishing bite. 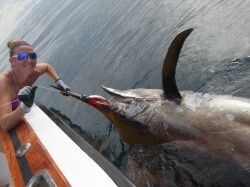 Captain Mike Neto of the Adrianna Fishing Charters shared his secrets for small boat tuna fishing. 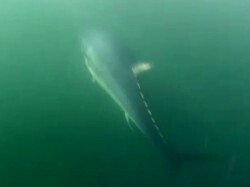 The bite was non-stop and they caught way too many bluefin tuna, false albacore, and green bonito to count. 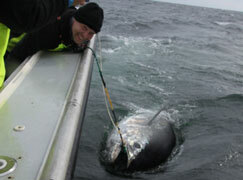 Some of the fish were nearly 30lbs and all were caught on only medium weight conventional tackle. 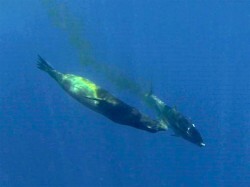 The fish were following around the draggers and were even caught on jigs. If you have questions about any of the equipment used during the show, please contact us. 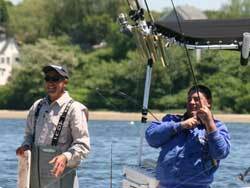 Click here for our Tuna Trolling, Tuna Jigging, and Tuna Plugging gear recommendations.